This quote is commonly attributed to Edmund Burke, an Irish statesman, author, orator, and political philosopher who lived in the 1700s. The depth of Burke’s words continue to resonate today. In fact, I thought of his words of wisdom when reflecting on the latest episode in the ongoing saga surrounding the auction-rate securities travesty. 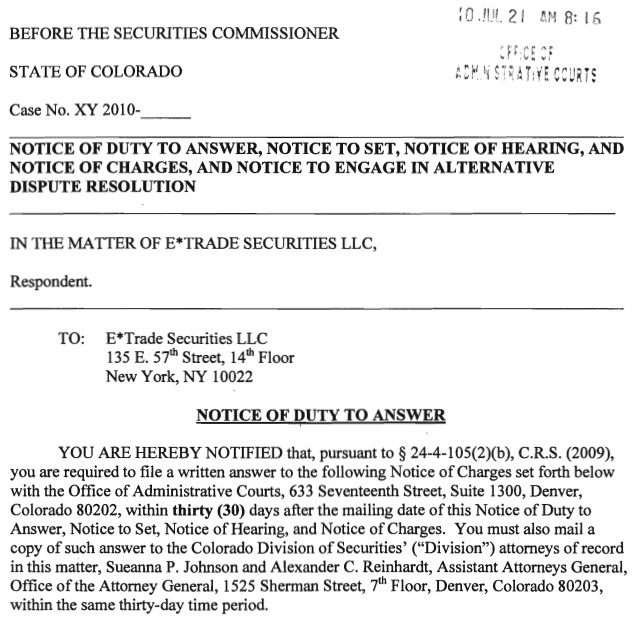 The Colorado Division of Securities has filed charges against E-Trade Securities LLC, a New York broker-dealer, alleging the firm sold Colorado investors auction-rate securities without properly informing them of the risks involved. 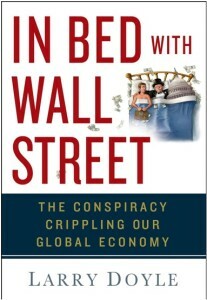 The securities were marketed as liquid, short-term investments, but the auction- rate markets froze in February 2008, preventing investors from obtaining their money. The complaint before an administrative-law judge seeks revocation, suspension or the imposition of conditions upon the broker-dealer license of E-Trade in Colorado. No hearing date has yet been scheduled. Previous actions against other firms have been settled and investors reimbursed. Did this case just happen to develop in Colorado? No, it did not. The simple fact is, those following this ongoing nightmare are well aware that one Colorado-based investor has doggedly pursued Colorado officials to file this complaint. This individual has persisted when few if any cared to listen. He never gave up. He was convinced that he had been defrauded. Neither his work nor the work embedded in the mission of Sense on Cents are complete. That said, the fact that Colorado officials have picked up the torch that this individual has shouldered and filed this suit against E*Trade should bring every citizen in our country a real measure of satisfaction. I implore each and every individual reading this commentary to briefly review the attached 16-page complaint filed by the Colorado Securities Commissioner Fred Joseph against E*Trade. Place yourself in the shoes of the investors highlighted in this complaint. Reflect on the fact that there are tens of thousands of our fellow brethren in a similar position. A nation of laws does not allow institutions such as E*Trade to act in the manner alleged in this report. The story of this complaint is virtually identical to that shared by almost every ARS investor with whom I have crossed paths across our entire nation. While a mere handful of Attorneys General and securities commissioners have brought suits on behalf of ARS investors, the overwhelming number of AGs, securities commissioners, and financial regulators in our nation have been remarkably silent. On that note, Sense on Cents calls on each and every one of these individuals occupying these positions to review this Colorado complaint and initiate the process to file a similar complaint within their own jurisdictions. Every attorney general is obligated to defend the rights and interests of their citizens who have been defrauded in the distribution of auction-rate securities. Why haven’t these attorneys general already filed suit? The ARS market froze in February 2008. If these attorneys had any real guts, they would have filed complaints a long time ago. If they need any evidence on the massive ARS fraud, they can go right here: Sense on Cents/Auction-Rate Securities. The aforementioned officials, individuals remaining frozen with ARS, and truly citizens everywhere in our land owe a debt of gratitude to the individual in Colorado who never gave up in his pursuit of justice. He toiled and fought when nobody seemed to want to listen. He marched on when nobody would follow. The fight remains far from over, but today I am happy to immediately induct this individual into the Sense on Cents Hall of Fame because he did not sit idly by, but rather took action and did something. He provides a real lesson for all of us!! I commend him. Please take ten minutes to review this complaint (click on image below to open up pdf document). The education embedded in this document will last a lifetime. Please subscribe to all my work via e-mail, an RSS feed, on Twitter or Facebook. Thanks. 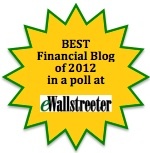 This entry was posted on Saturday, July 24th, 2010 at 3:50 PM	and is filed under ARPS, ARS, E trade, General. You can follow any responses to this entry through the RSS 2.0 feed. You can skip to the end and leave a response. Pinging is currently not allowed.